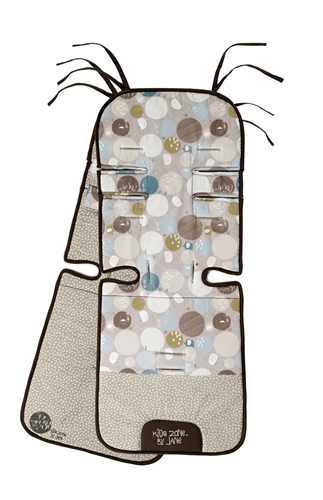 REVERSIBLE PUSHCHAIR SEAT LINER WITH AEROSLEEP. This reversible cotton seat pad with Aerosleep fits effortlessly into the stroller seat, and the 5 point safety harness fits neatly through the reinforced strap apertures to ensure your child is safe and secure. The seat liner is deep padded and wonderfully comfortable with great looking details, and it's also fully reversible, so you can change it around to suit your mood! Easy to fit and remove thanks to the design allowing for different types of pushchair harnesses. Universal - adaptable to all pushchairs on the market. Reversible cotton liner with breathable inner fabric specially designed for the hottest of days. This combination of materials along with the padding allows the air to circulate between the child and the pushchair, increasing the baby’s feeling of freshness and reducing sweating. It has bright patterns to liven up your pushchair. This mattress pad will protect the original fabric of your pushchair, prolonging its useful life! It’s as if you’ve got a whole new pushchair! Easy to clean; hand washable.